I rarely promote Apple products, mostly because there are rarely deals on them. 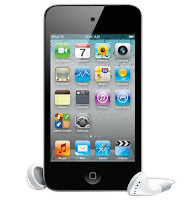 Today is a special day then, because this 4th Generation Apple iPod Touch is just $140, and included FREE shipping. This little gadget usually retails for $200. An iPod Touch is essentially an iPhone without the actual phone, or a Nano with apps and extras. The 16GB hard drive holds as many songs, apps, and videos as you can handle. It's got a 3.5-inch multi-touch display, front and rear cameras for pictures and 720 HD video recordings. Use it for face-time chatting, surfing the internet, playing games... everything but making an actual phone call. It's also got the Nike app built in if you want to gauge your workouts! Click here to view the deal at 1 Sale A Day.